Some more purchases for 2014. Happy to receive some comments and recommendations for other 2014 releases. 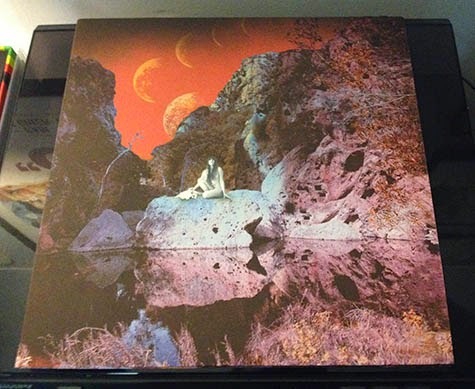 Between Angels Of Darkness, Demons Of Light I and II, I found myself both enchanted by and invested in Earth's instrumental vision, Dylan Carlson's lengthy, guitar-enriched, country-infused drones a voyage of sorts, dirt-encrusted and vast. 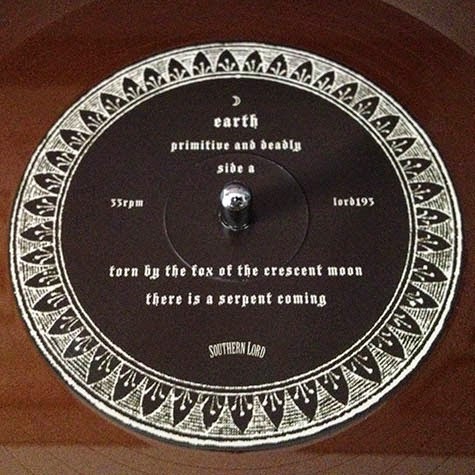 For Earth's newest release, Primitive and Deadly, Carlson invited vocalists Mark Lanegan (Screaming Trees, Queens of the Stone Age) and Rabia Shaheen Qazi (Rose Windows) to contribute voices, adding a new layer to his ultra-slow movements, which, for this release, gain some momentum and a touch more grit. "Torn by the Fox of the Crescent Moon," with crystalline notes that follow the track's thematic grind, introduces the album's patient stride. While "Crescent Moon" is ruggedly gorgeous, there's some sinister contrast to Lanegan's first track, "There is a Serpent Coming," his war torn, blues-bred throat married to the tones beneath. The full b-side is devoted to "From the Zodiacal Light," Qazi's vocal belted out, lovely against the backdrop. Granted, some of what you'll hear in Primitive and Deadly seems recycled from prior Earth albums, maybe stuck in the comfort of its own self-generated mire. This is especially true of the second half of the album with tracks like "Even Hell Has Its Heroes" and "Badger's Bane." Even the other Lanegan track, "Rooks Across the Gates," brings to mind the same ultra-slow travelogues found in the Angels series and 2008's The Bees Made Honey in the Lion's Skull. But, this doesn't make the tracks any less enjoyable. The first half features its strongest offerings, but Primitive and Deadly remains a worthy addition to Earth's canon. And, it sounds great through a stereo. Hyper surreal street poetry over minimalist electronics: no one sounds like clipping. Before I'd heard CLPPNG, the group's Sub Pop debut, I saw the band live performing these tracks with stage rumbling bombast and emcee Daveed Diggs' lightning fast wordplay. In terms of sound and presence, the performance was solid. 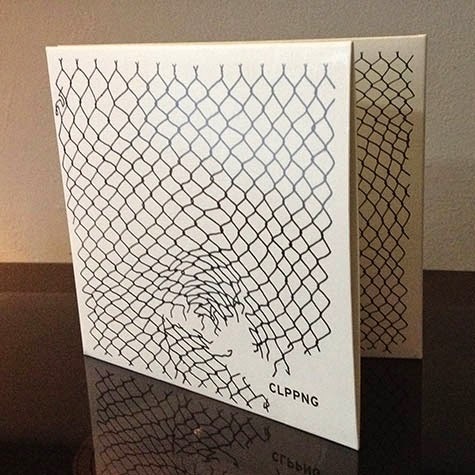 I was naive to think that the same level of volume and intensity could be duplicated with a studio release, so I found myself somewhat disappointed when I gave CLPPNG a spin initially, an opinion that has steadily grown more positive. And while I do at times still consider the production comparably thin, the group's adherence to its own idiosyncrasies makes for some remarkable moments, clanging percussion, pouring water, incidental environs, synthesizers and alarm clocks providing key elements to much of what you'll hear. Standouts like "Body & Blood," "Taking Off," "Dream" and "Story 2," exhibit Diggs' knack for spitting thickly descriptive verse, not to mention the group's often aversion to straight rhythm and pop-laden hooks. The only song I really don't like on this album is "Tonight," which is an unpleasant and grating listen. Amidst the sounds of processional organ and the great outdoors, Electric Wizard's latest tribute to doom, devils and smoke, Time to Die, is introduced by a news anchor detailing some grisly scene wherein a murder was committed in name of Satanic ritual and controlled substances. Next, riffing on what sounds like some homage to the theme of Phantom of the Opera, "Incense for the Damned" pushes an impenetrable wall of metallurgic tar through chord and tempo. Strong opener. "We wanna get high before we die..."
Following 2010's Black Masses, which didn't necessarily earn the band a whole lot as far as praise is concerned, (because it wasn't very good), Time To Die is what some might recall a return to form, itself a fully-realized, muck laden and serrated doom proper. 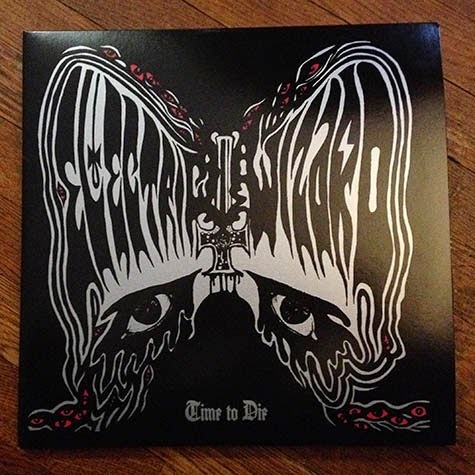 Listening to Time to Die you get the sense that Electric Wizard (members Jus Oborn, Count Orlof, Liz Buckingham and Mark Greening) thought about what they were pulling together for this album, keeping their obvious allegiance to amplification and darkness but not shying away from the occasional melody or change. The title track for instance is pure sludge, thick enough to drown in, but that subtle touch of synthesizer melody following the hook really does something to enhance its otherwise simplistic construct, not to mention the soloing guitar phrase they add. 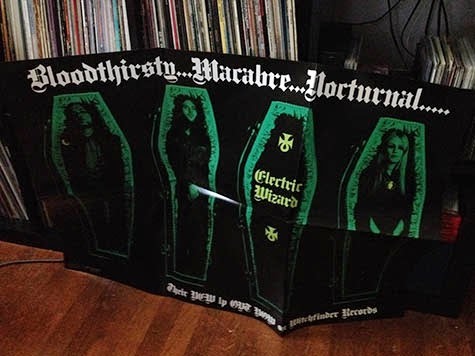 While I get that a lot of what Electric Wizard does seems predictable, it's difficult not to consider what the group accomplishes in terms of reps and strokes. Sure, they're a doom metal band inhabiting the lowest instrumental registers possible, crafting sounds deep enough to crush small animals via sonic weight alone. Through sheer gut, I responded with the utmost appreciation when the solid, guttural blocks of guitar sound came across in "I Am Nothing." Is this type of song unusual or somehow an evolution of sound for Electric Wizard? No, absolutely not. But, I'll be damned if it doesn't sound good. Certainly there's no skimping on the noise factor through these grooves, nor the density of their output. And, if you want something faster, check out "Funeral of Your Mind," which almost sounds like something Kyuss might've come up with had they absorbed more Pentagram or Saint Vitus during their heyday. One of the LP's more refined offerings, "We Love the Dead," features one of the album's best riffs, a sly and sinister lick that evokes Iommi at his heaviest. Following with an acid rock march, "SadioWitch" provides the album its single most modestly timed song, a mere four-something minutes next to the album's host of otherwise seven to eleven-minute downers. And then "Lucifer's Slaves" rocks out like Blue Cheer or King Crimson tripping millennial, occult-centric balls, falling hard on every heavy down stroke and sneaking in those momentary fret seizures. 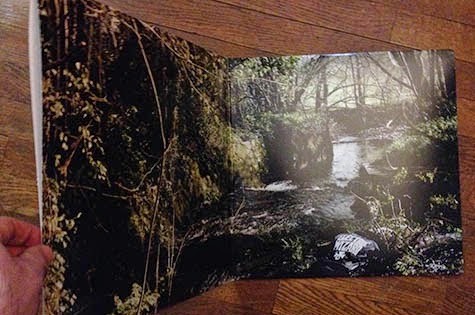 Time to Die is a double-LP with a nice gatefold and a poster. Another stereo gem.